... you'll notice that we are all reading the same book. 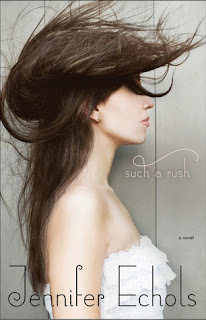 This book is Such a Rush by Jennifer Echols. You may also notice that this book is not set to be released until July 10th of this year (Mark it on your calenders people. You need this book). This is because... drum roll please... we have been asked to review this book before it even hits the shelves! Jillian Vandall, a publicity assistant at Simon and Schuester, (Shoutout. We love you!) contacted us at the start of our blog, when we were just a little baby blog, and asked if we wanted to review Jennifer Echols' newest book. We of course said "Heck yes". Since this is our first pre-release book, we decided to make this a group review. So you'll be getting a little bit of all of our flavor. Not all of us are done with it, but from what we have read, we can say that this is an AMAZING, FABULOUS, MUST-BE-READ book.